I had a chance to interview Artist Julia Greer Fobes of Julia Greer Fobes: Fashion, Art & Flowers. After seeing her incredible work doing the recent Mardi Gras season I was intrigued by her sense of style. I was lucky to catch her during a break in her busy schedule. Check out our exclusive chat to find out more about her and where you can find her work. 1. Can you share with our readers a little more about yourself? JGF: I am from Mobile and I have been creating art since I was a child. I always knew I wanted to do something creative in my everyday work. I studied art and photography through high school and then went on to Ole Miss, where I graduated in 2007, to pursue Studio Art in addition to Costume Design and Technology. Since college, I have had the opportunity to work with three of the most talented artists in our area: Nall, Bruce Larsen, and Ron Barrett. The lessons I received in technique and craftsmanship were second only to the advice they shared with me on what it means to be an artist in our community and to sell yourself and your work in a positive and productive way. I learned quite a lot about myself and my art during those experiences. Last March, I decided it was time for me to work for myself so that I could focus all my energy on what I now see as my contributions to the art of this community. 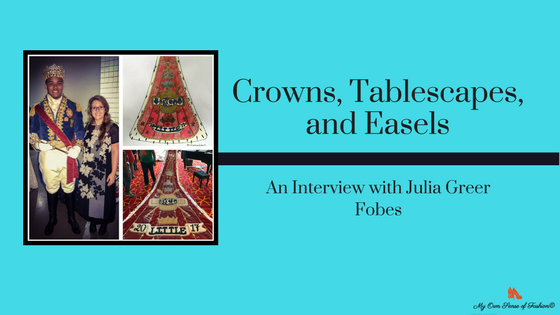 That is how Julia Greer Fobes: Fashion, Art & Flowers was born. My main priority now is the fashion of Mardi Gras. I design and create costumes, trains, gowns, collars, pins, umbrellas and just about anything else for the royal monarchs and court members of the different Mardi Gras organizations. Throughout the rest of the year, I also produce florals and decor for weddings, corporate events, residential and commercial properties and participate in community involved projects like the Annual Providence Hospital’s Festival of Flowers. I also love to paint, so I do take a handful of commission pieces each year to keep my hand in that world too. 2. During the Mardi Gras season, you worked with the MAMGA court in more than one compacity. Can you share more about the overall experience? JGF: This was my first year working with MAMGA and I cannot say enough good things about the entire experience. I worked with the Juvenile King Joseph Little and his family to create a new costume and train for his reign. His look was inspired by an old military photograph from the Regency period as well as his love for football and his school, St. Paul’s Episcopal School… which is also my Alma Mater. I also designed and produced a new costume for the MAMGA King Olabode “Dayo” Anise. He borrowed a train from a past King, but I made five large motifs to add to it, in order for it to match his costume. In the end, the entire look felt personalized to Dayo and the Anise family. I also designed the King’s royal pin, which was taken from the family crest I produced for the train. Besides having the opportunity to work with the two kings, I was delighted when Queen Katherine Smith came to me to decorate her Queen’s Party, which takes place after the Royal Coronation. She didn’t want Mardi Gras and she didn’t want a wedding, so it was up to me and my team to find out where the happy middle ground would be and I think we accomplished that! The entire three-room space was completely covered in ice pink and champagne gold. I had great feedback from all of my clients and the MAMGA community as a whole. I hope to continue working with MAMGA for years to come and look forward to building more relationships through those experiences. 3. Switching gears a bit you come from a costume design background. What would you say is the most challenging? JGF: Before getting into building these Mardi Gras trains and costumes about six years ago, my only costume design background was in college while studying Costume Design and Technology at Ole Miss. There are always challenges and I feel like I am constantly learning as I go. I joke that as soon as we finally have something figured out, it’s over and we are moving on to something else… but that is just the nature of this business too I think. The costumes and collars or anything that requires a specific “fit” are always the most difficult to get right. We are all so very different and come in many shapes and sizes, so getting that right fit or drape or curve can sometimes be very tricky. Creating the trains are a much looser art for me. I see them as large paintings…. instead of paint, I layer different fabrics, appliqués, and rhinestones! 4. Now for a fun question. Name one event (past or present) that you would love to work on and why? JGF: I strive to continue building my portfolio of Mardi Gras work in Mobile. I would love to expand on my fashion, art and flower designs for the Mobile Carnival Association and the Mobile Area Mardi Gras Association. I would also love the opportunity to work with any of the other dozens of Mardi Gras groups within our area. I also think it would be great fun to maybe one day try my hand in float building and design. Mobile Mardi Gras is such a special thing and I am proud to help represent a new generation of carnival artists in our local community. 5. Your business is based here on the Gulf Coast. What is it that makes this area so special especially to someone looking to visit? JGF: I was born and raised in Mobile and lived across the bay for years, before moving back to Mobile about five years ago, where I work out of a studio behind the midtown cottage my husband and I live in. My grandparents live on Mobile Bay and my parents have a house on Soldiers Creek in Lillian, so I have grown up on the water. The environment that surrounds us is so unique and the older I get the more I appreciate every part of it. The fact that I am able to be creative in my everyday work and make a living doing what I want to do in my hometown is wonderful. There was a time when I thought I would have to be in a bigger city to realize my dreams, so Mobile, Baldwin County, the Bay, the Gulf, Mardi Gras and all the culture that surrounds us means everything to me. There is always something for everyone going on here, so it is a visitor’s paradise. I am so lucky to have been born into this community and there is nowhere else I would rather be creating. I feel truly blessed in my life here because the inspiration is endless. 6. Lastly, where can people find you and your work online? JGF: Please follow me on Facebook… Julia Greer Fobes: Fashion, Art & Flowers. That is where I post a majority of my work and excursions! I also use Instagram and Snapchat and you can find me there under @juliagreerfobesfashionartflow. Thanks again to Julia and be sure to check out her work online.